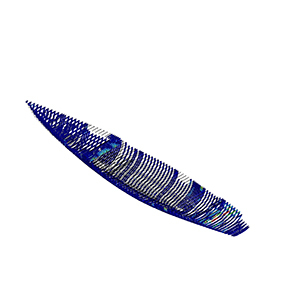 FEA-Solutions (UK) Ltd - Finite Element Analysis For Your Product Design | 126: Large Sailing Yacht Hull Stress analysis of large sailing yacht hull subjected to several load combinations comprising accelerations, hydrostatic pressure and rigging loads. Geometrically very complex model with very fine mesh size. Complex load calculation done with tools outside the FEA software. Stress analysis of large sailing yacht hull subjected to several load combinations comprising accelerations, hydrostatic pressure and rigging loads. Geometrically very complex model with very fine mesh size. Complex load calculation done with tools outside the FEA software.